To breathe simply means inhaling oxygen and exhaling carbon dioxide. Now, where does the oxygen go after we take it in and where does the carbon dioxide come from? This is where the respiratory system, one of the major systems of the human body, comes in. Passages within the human body, through which air travels to the lungs to carry out the process of respiration. Nasal cavity and nostrils: They mark the main entrance to the respiratory system as air passes through them into the next part of the airways. Paranasal sinuses: Air-filled spaces surrounding the nasal cavity. Oral cavity (mouth): Serves the same purpose as the nostrils; may also serve as an alternative way for letting air enter the respiratory tract. Pharynx (throat): Muscular funnel-like structure, extending from the end of the nasal cavity to the beginning of the larynx. It is divided into nasopharynx, oropharynx, and laryngopharynx. Larynx (voice box): A flexible yet tough segment, larynx connects the pharynx to the trachea. Trachea (windpipe): Largest airway in the respiratory tract, lets the inhaled air pass through to the bronchi and then into the lungs. Bronchi: The trachea splits into two thick hollow tubes, known as the bronchi. bronchioles: Both bronchi branch into narrower tubes within the lungs, referred to as bronchioles. Alveoli: Small air sacs at the end of each bronchiole. Two squashy, air-filled lungs are located at the left and right sides of the thorax (chest), both protected by the rib cage. 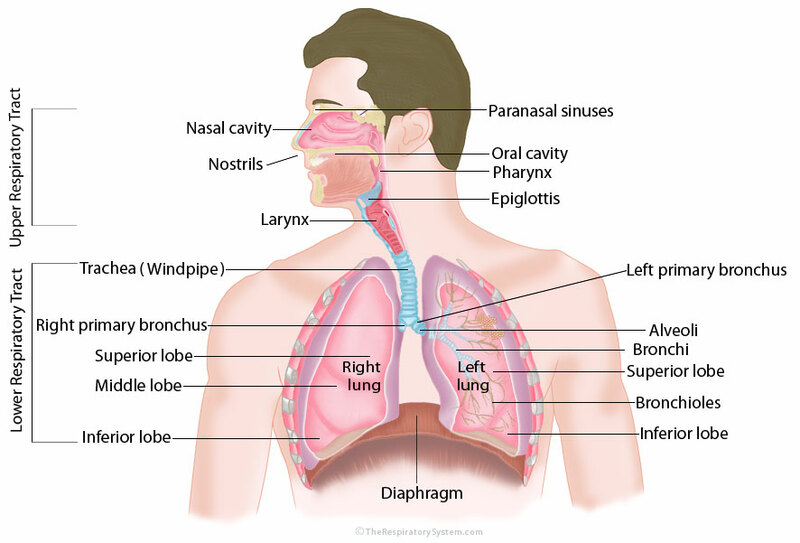 The inhaled air enters the lungs through the trachea and bronchi. The right lung is divided into three lobes while the left one has only two. External intercostal muscles: Situated between the ribs, they function to spread out the rib bones during the process of inhalation, to allow the air to enter the tract. Diaphragm: Flattish, dome-shaped muscle located beneath the lungs, the diaphragm works with the lungs, contracting and expanding to aid in inhalation and exhalation. There are a number of bacterial, viral as well as chronic diseases that may affect the human respiratory system, with pneumonia, influenza, asthma, bronchitis and chronic obstructive pulmonary disease (COPD) being a few of the common ones. A healthy adult has a respiration rate of 12-20 breaths per minute when resting. Every day, we breathe in about 11,000 liters of air. The breathing rate in women and children is slightly faster than that of men. Yawning occurs when the respiratory system does not receive enough oxygen through inhalation. The brain senses the lack of oxygen and sends a signal, making you take a long deep breath, that is, a yawn. The lungs, containing millions of tiny balloon-like structures (alveoli), can float in water, being the only organ in the human body to do so. In ancient Egypt, the windpipe and lungs together served as a symbol of unity between the Upper and the Lower Egypt.